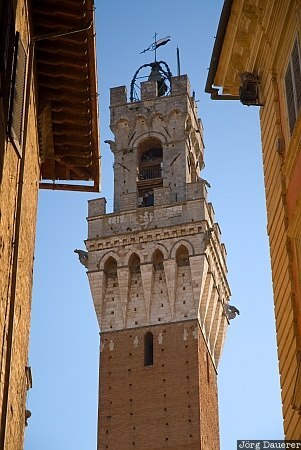 The tower Torre del Mangia which is part of the town hall of Siena (Palazzo Pubblico) at Siena's spectacular central square, the Piazza del Campo. Siena is in the central part of Tuscany, Italy. This photo was taken in the late afternoon of a sunny day in October of 2009. This photo is part of the exhibition Towers (February 2011). This photo was taken with a digital camera.